(Los Angeles, CA) - DENK gallery is pleased to present Pairings, an exhibition featuring works by 12 Los Angeles-based painters and sculptors. Selectively matched, and given free interpretative reign within an allotted area of the gallery, the artists explore the tangential visual and conceptual relationships galvanized by the paired interaction of their works. The relational space and contiguity created by these encounters are generative, forging unexpected connections and new connotative points of access. In Pairings, artist-chosen selections correlate across two-dimensional and three-dimensional media, framed by the specific curatorial choices of each collaboration. Linked by this gesture of conversation and reciprocity, affinities and contentions emerge in the spaces generated by proximity and overlap. Pairings will feature new and recent paintings and sculptures by six duos: Carlos Beltran Arechiga and David Hendren, Martin Durazo and Jenn Berger, Mira Schnedler and Andre Woodward, Andrew Schoultz and Kiel Johnson, Chris Trueman and Michael O'Malley, and HK Zamani and Lana Duong. Carlos Beltran Arechiga creates dynamic paintings in which gestures and structures merge. Lush strokes and thick gestural impasto punctuate geometries and patterns that suggest both abstract and architectural spaces. His use of construction materials like enamel and caulking paste imposes concrete materiality to the pictorial, a choice made to anchor it in the physical. The artist investigates the shifting reconciliations made to arbitrate the digital and corporeal simultaneity of contemporary life. David Hendren explores visual vocabularies across a variety of media, harnessing the interstitial potential of their crossovers. Often producing hybrid sculptural forms or built environments, Hendren is interested in sensory phenomena and the associative potential of materials. For Pairings, the artist has created a series of sculptural panels in wood, tinted glass, enamel, aluminum, copper, and string, each with a face inlaid in the panel. Framed by abstract carvings and deliberate material signifiers, Hendren visualizes a range of human connections. Martin Durazo is an artist who explores the formal tenets of painting alongside the meditative repetition of mark making. Using bright washes of color in overlapping fields, contrasting lines and suggestions of geometry, Durazo creates varying degrees of translucency within the sediment of his surfaces. The works are intimate, sensory, and emotive, baring the trace evidence of time and gesture to compel a heightened awareness of the present. Mira Schnedler's fraught paintings combine clear stylistic derivations from early 20th-Century European art history with a contemporary and idiosyncratic sensibility. The European influences of German Expressionism, French Impressionism, the German Brücke painters, and the likes of Otto Müller, and Max Beckmann are evident, as are later American Abstract Expressionist antecedents as well. Intense and eruptive, Schnedler's works feel dynamically incongruous. Andre Woodward's bionic hybrids and three-dimensional living systems, are sculptural infrastructures and at times living ecosystems meant to change and erode. By combining live vegetation, woods, concrete, and sound to create dissonant and unexpected morphologies, his works consider the tension between the natural and the manmade, the spontaneous and the orchestrated. Andrew Schoultz's frenetic large-scale paintings and murals harness an imagistic chaos, exploring themes like war, spirituality, environmental crisis, and power through quasi-mythological allegories. His intricate line work and rendering produces a density and tension in the sinewy excess of marks; like forms physically excised or branded. Schoultz's visceral, illustrative imagery draws from a place of fantasy and observation, while the works themselves feel historically ambiguously and simultaneously old and new. Kiel Johnson is an investigative artist interested in sculptural metaphor and the personification of the inanimate. Johnson works across a variety of media, including drawing, and will be producing a ceramic, life-sized altar installation for the exhibition. This symbolically loaded object is culturally imbricated in a constellation of themes Johnson intends to invoke, including worship, the occult, energy and alchemy, and the provision of snake oils, tinctures, and antidotes to dedicated disciples. Chris Trueman is an abstract painter who creates vibrant, dynamic surfaces through the interplay of color, line, and gesture. Formally appropriating techniques from, and incorporating art historical references to, op art, graffiti, abstract expressionism, print, and digital media, Trueman's stylistic language is a pastiche of formal intimations. By co-opting the intended effect of any single stylistic convention through its anachronistic recombination with others, he creates dynamically incongruous surfaces in which calculated accidents are mitigated by intuitive spontaneity. Michael O'Malley's sculptural works are poetic digressions, alternate material propositions to the dominant social imperatives of utility and function that shape the social place of objects. Often created in the likeness of familiar everyday forms, his atypical reinterpretations of them are unconventional and idiosyncratic, expressively dissonant rather than functionally or realistically constrained. O'Malley's use of reclaimed materials and repurposed scrap wood also posits a material alternative to the environmental strain of unchecked consumption and manufacture. HK Zamani is a multidisciplinary artist and curator, and founder of PØST, an alternative exhibition space in Los Angeles. His abstract paintings are terse and meditative, painterly and deliberately composed. These formal abstractions are inspired by earlier works in which the symbolic appearance of a dome or tent structure is recurring. Interested in the shifting nature of perception and optics, Zamani has drawn from a varied sensory spectrum ranging from the ascetic to the psychedelic. Lana Duong's sculptural works consider the physical dynamics of imposition, control, and submission, positing a range of visual metaphors for the excessively fluid contemporary conception of the self, in which the individual is an amorphous and ill-defined entity. A large, soft suspended form of vinyl, styrofoam, plaster, and metal chain is meant to look like a huge pet toy. Intensified by strategic exaggerations and contractions in scale, some objects are monumental while others are intimate, and an uncomfortable anthropomorphism, her sculptures become manifestations of identity in a state of extreme indeterminacy and limbo. 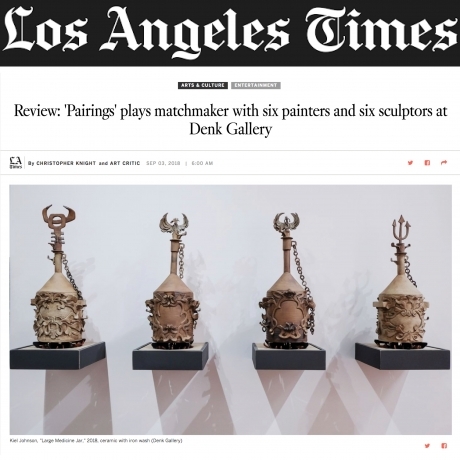 Founded in January of 2017, DENK is a recently established gallery in Downtown Los Angeles' thriving arts district. Its founding mission is to present a diverse program of local and international contemporary artists working across a variety of mediums, including sculpture, installation, painting, photography, works on paper, and interdisciplinary media. The gallery's goal is to curate engaging exhibitions by artists who are creating relevant, substantive, experimental, or timely work. By providing an adaptable venue that will allow artists to develop their concepts and have them realized, DENK hopes to foster a generative curatorial space.